You may have seen Adam Foote playing his handpan while walking the streets of Coeur d'Alene or taking a hike. He says the instrument has helped him find healing and happiness. COEUR D'ALENE, Idaho — A North Idaho man is finding healing through nature and music while playing a very unique instrument. 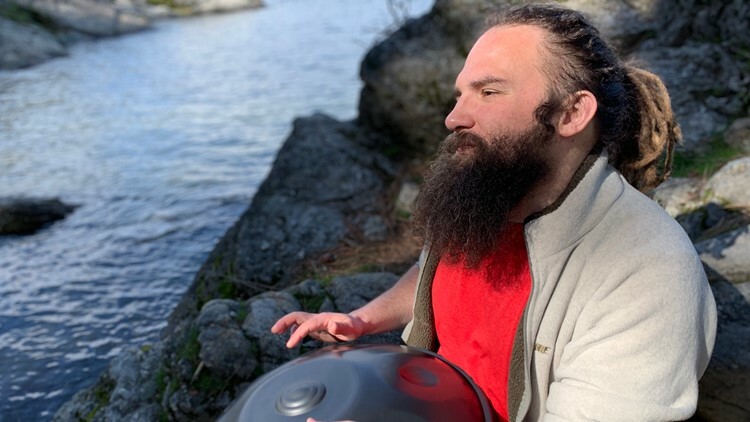 You may have seen Adam Foote playing his handpan while walking the streets of Coeur d'Alene or taking a hike. Foote – who some people may know by his stage name of “Ethereal in E” – plays his instrument to the beat of nature’s song, feeling at home as the waves hit the shore of Lake Coeur d'Alene. “Ethereal means heavenly sounding and so I thought, ‘What a great description of my music,'” Foote said. The music he plays has become a part of him and the handpan an extension of his body. Years later, Foote was trying to make ends meet and found himself doing what he could for extra cash. Foote thought this could be an opportunity to become a professional musician. “I perform a lot, enough that has allowed me to quit my day job, which I was an elementary school counselor before. Shout out to the kids at Borah Elementary School. I loved working with you guys,” Foote said. “But it's time for me to open up a new chapter, follow my dreams and see where this crazy UFO-shaped looking instrument is going to take me,” he added, laughing. When life becomes all too real, some find that music takes them exactly where they need to be. Foote's dream is to travel the world and make music videos in amazing nature spots. He has made many in different spots around the Inland Northwest. Those who are interested in seeing some of Foote’s videos or watching him live at an event you can visit his Facebook page.